Thu., Dec. 24, 2015, 7:05 a.m.
A GRIP ON SPORTS • It seems like every year Festivus sneaks up on me. Missed it in this space yesterday. I was ready to air a lot of grievances, starting with ... oh heck, it’s Christmas Eve now. No reason to dredge up past problems. Let’s get on to what we have to share today. Read on. • We’re not going to opine much today – the feats of strength after dinner last night has really bothered my back – mainly because it is the day before Christmas. The Zags looked good last night, the Cougars a little less so and Brett Rypien, whoa. Have a bowl game. How’s that for sports commentary. But before we get to the links, I wanted to take a little time and thank all of you for coming here today, and most every day during the year. I know the readers of this column don’t comment much – even when I beg – but the stats show we get quite a few of you on a regular basis. I take that as proof we’re doing something right, even if only a little. Hopefully, you’ll continue to come back the day after tomorrow – we’re taking Christmas off, unless I get bored and decide to post; if that happens I’ll inform everyone through Twitter – and every day after that. We’ll be here as long as they let me. With that, Merry Christmas folks. I’ve got some – you can read that as “almost all of it” – last-minute shopping to do. 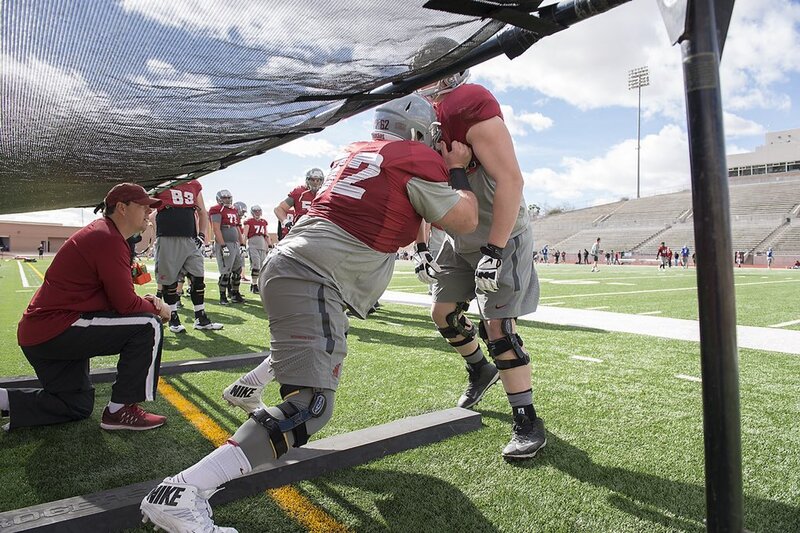 • WSU: Bowl games are not only for football, but for life experiences. At least the best ones are. The Cougars had one of those yesterday, when they toured Fort Bliss, the Army base near El Paso. Jacob Thorpe documents their experience in this notebook. Of course, they also practiced and Jacob has video of interviews with Mike Leach, Joe Salave’a, Clay McGuire and Graham Harrell afterward. Jacob also has a short morning post. ... If you only have time for a couple stories, don’t miss this one about Christmas and bowl games from ESPN.com’s Pac-12 blog. There is also the blog’s weekly mailbag a couple days early. ... The Tmes’ Stefanie Loh has a feature on Jeremiah Allison and his relationship with the late Ellison Floyd. ... The Hawaii trip might be scenic, but the basketball team isn’t finding it enjoyable after it lost again, this time 63-59 to Northern Iowa. ... There were only a couple of other Pac-12 basketball games, with USC winning again and Colorado’s 11-game winning streak snapped by SMU. • Gonzaga: As we said, the Zags played well once again, dominating early and often against Loyola Marymount. Jim Meehan was there and has this game story while Jesse Tinsley adds a photo report. ... Portland made Pepperdine’s Pacific Northwest road trip one to forget, handing the Waves an 87-79 defeat. ... Saint Mary’s is still hot, as the Gaels rolled over Santa Clara 81-59. ... USF got past Pacific 89-76 in the other conference game. ... Both BYU and USD won non-conference matchups, the Cougars in Hawaii, 96-66 over New Mexico. • Preps: The Associated Press announced its all-state football teams yesterday and a handful of local players were honored. • Seahawks: The Rams are not going to the playoffs – again – but they always seem to give the Hawks fits, especially quarterback Russell Wilson. Though as hot as Wilson’s been lately, maybe this is the game he dices up St. Louis. ... Michael Bennett has been known to ride a bicycle. And now he’s been known to support Bernie Sanders. I think there may be a correlation there. ... Brandon Mebane has returned from significant injury and re-energized his teammates. Can Marshawn Lynch do the same thing? ... Richard Sherman has changed. And K.J. Wright’s life is about to. • Mariners: The M’s roster restructuring continued yesterday, though the moves were of a minor nature. • Sounders: Andy Rose is leaving Seattle for an English team.